NASA officials estimate the ICESat 2 mission is facing a $200 million budget overrun and a one- or two-year launch delay after difficulties with the satellite's laser altimeter designed to track changes in Earth's polar ice sheets. The space agency will not commit to an exact budget and schedule for the Ice, Cloud, and land Elevation Satellite 2 mission until top managers approve the plan and submit it to Congress within a month or two, according to Stephen Cole, a NASA spokesperson. The revised ICESat 2 budget and schedule was presented to NASA's leadership last week. Michael Freilich, head of NASA's Earth science division, told an advisory committee May 28 that ICESat 2's overrun was "on the order of $200 million." Development of ICESat 2 was supposed to cost $559 million when NASA formally set a budget for the mission in 2012. The launch was scheduled for as early as mid-2016 on a United Launch Alliance Delta 2 rocket from Vandenberg Air Force Base, Calif.
Freilich, who described the budget overrun as a "significant breach" of NASA's cost commitment, said the launch would likely be rescheduled for late 2017 or 2018. He said NASA will pay for ICESat 2's increased costs from within the Earth science division without raiding budgets for other missions. Although Freilich did not rule out delays to other Earth science missions stemming from ICESat 2's troubles, he said NASA will find much of the extra funding ICESat 2 needs from money paid back to the government by projects that finished under-budget. "We're not asking for more money without catastrophically perturbing our program," Freilich said. "We have a large number of launches in the last couple of years, this year and next year which are launching on time and under their confirmed budget commitment ... That money then rebounds back to the Earth science division, and we can use it solve the occasional problem." The Global Precipitation Measurement mission launched in February for less than NASA originally budgeted, and the Soil Moisture Active Passive mission is on track to run under-budget for launch in November, said Peg Luce, deputy director of NASA's Earth science division, told the science committee of the agency's advisory council in April. 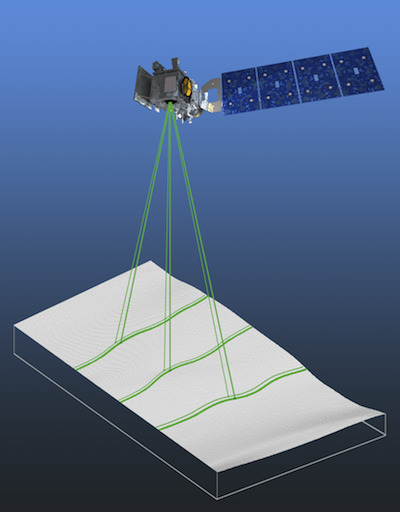 ICESat 2's problem lies in the development of the Advanced Topographic Laser Altimeter System, the satellite's only instrument. The altimeter will fire visible, green laser pulses 10,000 times per second as the satellite flies in a 307-mile-high polar orbit. The altimeter's contractor is Fibertek Inc., and Orbital Sciences Corp. is under contract to build the ICESat 2 spacecraft. The laser altimeter on ICESat 2, a different type of sensor than the laser flown on ICESat, will produce estimates of ice sheet thickness and mass to see how much polar ice is eroding away as global temperatures rise. "It's a very challenging new development," Luce said. "It's a photon counting laser ... It's an in-house instrument at Goddard [Space Flight Center], and we learned that there were just aspects of the system that were not as well understood as we hoped, and we needed to put a different team on the job, which we have done." Luce said the "cream of the crop" of Goddard's instrument development experts were assigned to ICESat 2. They found the laser altimeter's requirements were too stringent, and managers relaxed the sensor's operating constraints. A report by the Government Accountability Office in April found ICESat 2's systems engineering team did an insufficient analysis on the laser sensor and could not ensure it would function as a fully integrated instrument. The GAO reported that ICESat 2 officials identified the laser's optics subsystem was the biggest challenge due to its very strict requirements. ICESat 2 already cost more than NASA originally hoped when a plan to launch the mission on an Atlas 5 rocket with a U.S. Air Force weather observatory on the same rocket fell through after the military decided it did not need its weather satellite until at least 2020. The launch change forced NASA to pay for a Delta 2 rocket to launch ICESat 2 by itself, raising the project's overall cost by $84 million, according to the GAO report. NASA is required by law to inform Congress when a mission appears likely to overrun its approved budget by more than 15 percent, and the space agency submitted a notification to Congress on ICESat 2 in December as officials started to "rebaseline" the mission. NASA's Goddard Space Flight Center in Maryland manages the ICESat 2 project, which was ranked as a high priority in Earth science by researchers in 2007. ICESat 2's predecessor collected data from 2003 until 2009, revealing the thinning of the Arctic polar ice cap and diminishing land ice in Greenland. NASA is mounting an airborne campaign named Operation Ice Bridge to continue polar observations between the ICESat and ICESat 2 satellite missions.